Remote System Monitoring | West Coast Solar, Inc.
For solar system owners that want greater insight into solar system production, we offer remote system monitoring. Real-time and historic information is available on a module and system-wide basis, enabling accurate troubleshooting and greater understanding of system performance. In the past, solar owners largely learned about the output of their solar systems from utility bill credits or from looking on the inverter display for real-time data. Although this provides useful information, it does not convey the big picture of solar system performance. Now, some California solar system owners want greater understanding of how their system is performing. Does the energy output drop dramatically on a cloudy day? How much can the system produce on sunny winter days? With remote system monitoring, your solar performance data is measured and communicated to the monitoring system. You merely login to your account to view it. In many cases, your can view data on both a module and system level, depending how your system was configured. 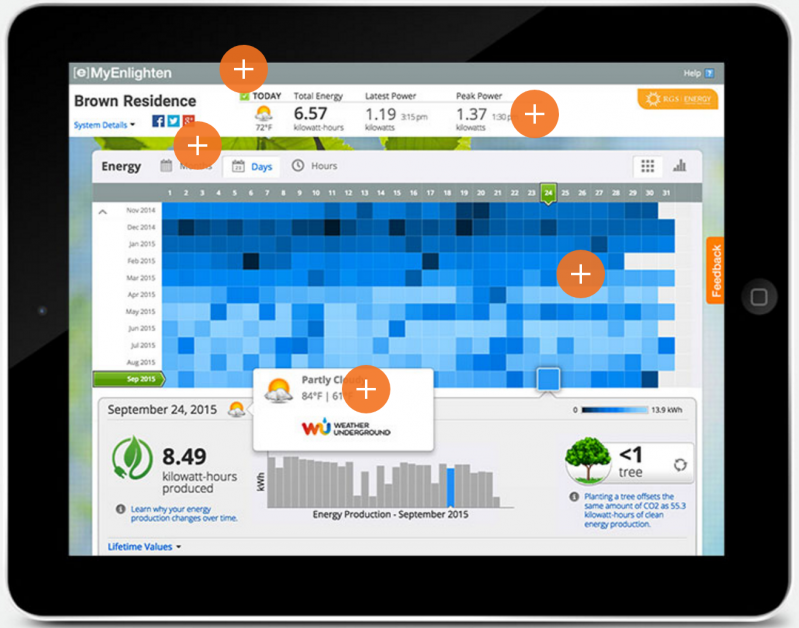 West Coast Solar offers two remote solar monitoring systems, both with mobile-friendly apps. The SolarEdge monitoring portal and the Enphase MyEnlighten have the ability to produce graphs, reports, provide real-time performance data, and historical information dating back to system installation. These programs are easy to use, and we provide you with all the information you need to get started. System monitoring gives you the capability to monitor your system from anywhere, even while on vacation. This gives homeowners the ability to gather valuable information directly from the solar system. With no moving parts, solar energy systems are remarkably reliable in delivering clean energy to your home for many years. If an issue develops, monitoring systems assist in identify performance issues, helping to troubleshoot an issue quickly.